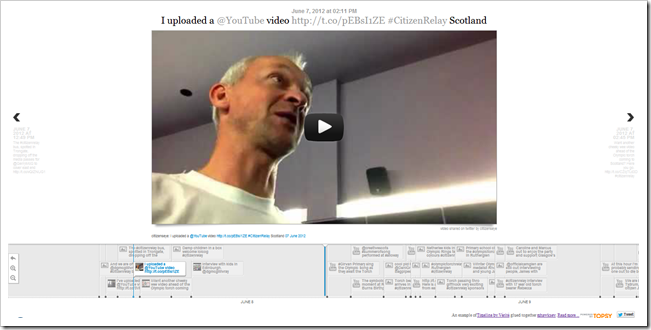 One of the first things I did was produce a Timeline of the CitizenRelay videos and images shared on Twitter. This uses the Topsy web service to find appropriate tweets which are stored in this Google Spreadsheet template which are then displayed in the Timeline by Vérité tool (an open source tool for displaying media in a timeline). The result is a nice way to navigate material shared as part of CitizenRelay and an indication of the amount of media shared by people. As part of the CitizenRelay Audioboo was used to record and share interviews. For a data wrangler like myself Audioboo is a nice service to work with because they provide a way to extract data from their service in a readable format. One of the undocumented options is to extract all the clips with a certain tag in a format which includes data about where the clip was recorded. 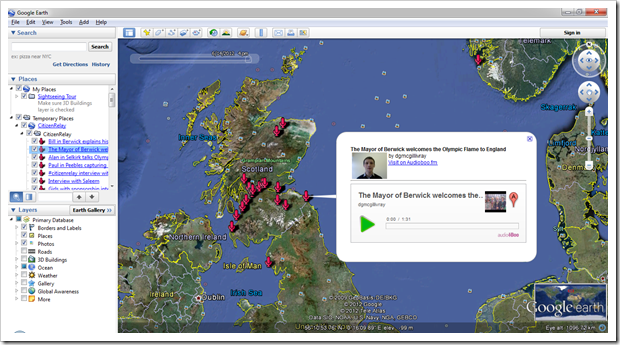 Furthermore this format is readable for other services so with a couple of clicks with we can get a Google Map of CitizenRelay Boos which you can click on and find the audio clips. One experiment I tried which didn’t entirely work out the way I wanted was to add date/time to the Audioboo data and also embed the audio player. This datafile (generated using this modified Google Spreadsheet template) can be played in Google Earth allowing to see where Boos were created, when they were created with a timeslider animation and directly playback the clips. This experiment was partially successful because I would prefer the embedded player worked without having to download Google Earth. So far we have mainly focused on the content but lets now look at the many eyes and ears of the CitizenRelay who helped share and create stories on Twitter. 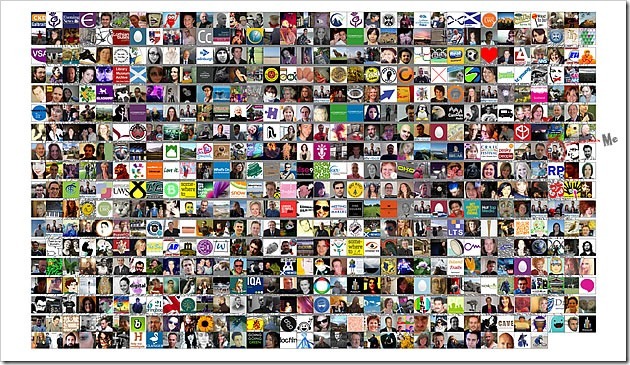 The image shows the profile pictures of over 600 people who used the #CitizenRelay tag on Twitter so far this year. This image was generated using a free add-in for Microsoft Excel called NodeXL, read more about getting started with NodeXL. What that image doesn’t show you is how interconnected this community is. 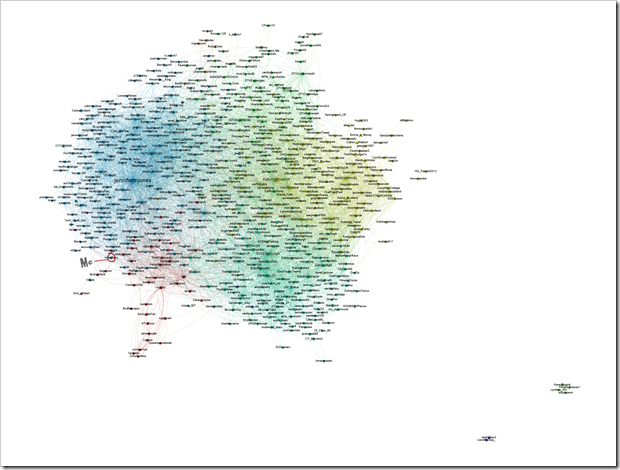 Using another free tool called Gephi and with the right data we can plot the relationships in this twitter community, who is friends with who (read more about getting started with Gephi). In the image below pictures of people are replaced with circles and friendships are depicted by drawing a line between circles. There are almost 7,000 relationships shown in the image so it can be a bit overwhelming to digest. Using Gephi it is possible to interactively explorer individual relationships. For, example the image below shows the people I’m friends with who used the #CitizenRelay tag. 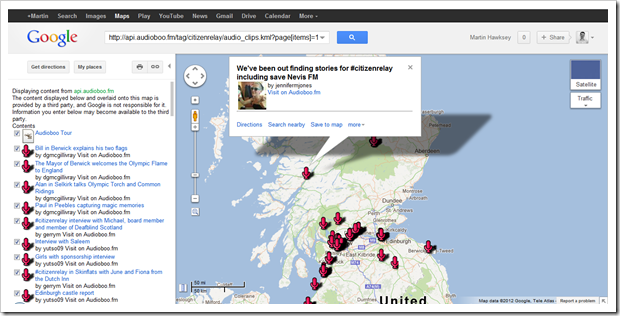 This image is evidence that #CitizenRelay wasn’t just a broadcast, but a community of people sharing their stories. 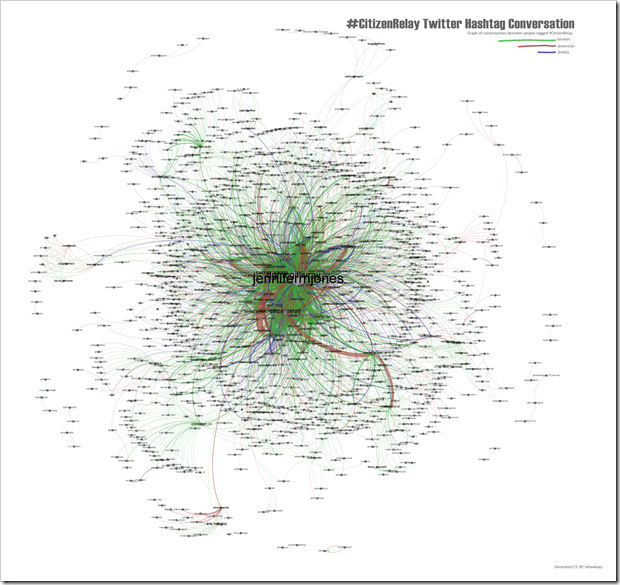 Visualising Twitter conversations is one of my interests and I’ve developed this interactive tool which lets you explore the #CitizenRelay tweets. So there you go some examples of what you can do with free tools and a bit of data, I’m sure there are many more stories to be found in CitizenRelay.